Soups represent a quick and easy way to prepare a healthy start to a meal. Many of them can simmer on the stove while you are busy preparing the rest of the items. If you’re just having soup they can be whipped up in a hurry and ready to eat in a matter of minutes. Best of all they are easy to keep healthy, since they rely heavily on vegetables and other wholesome ingredients. 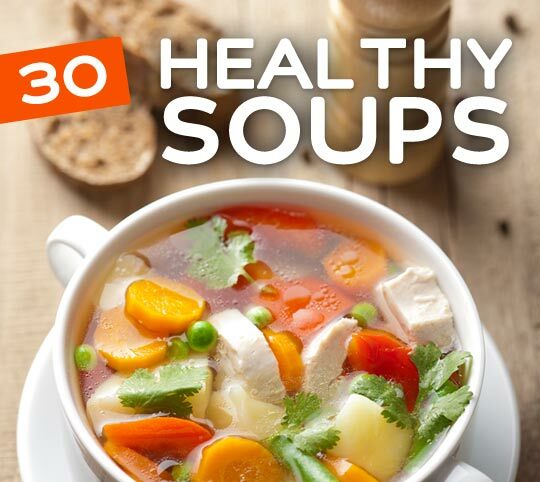 Here are enough healthy soup recipes to last you a month! 1. 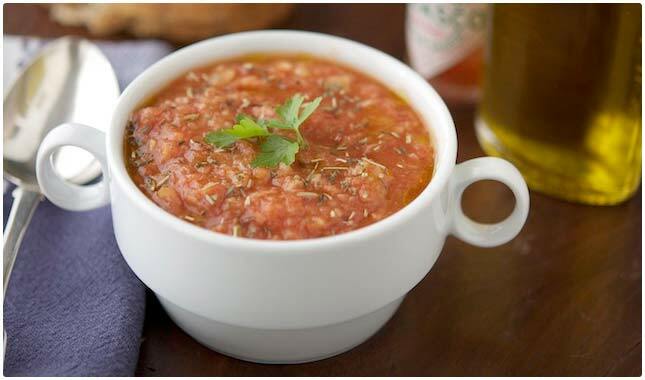 Tomato and Fava Soup – Tomatoes are widely known as being a food that’s really good for you, and the addition of fava beans gives added fiber. The other ingredients in this soup are very healthy for you, and what you’re left with is a nice start to a meal, or even a quick meal all by itself. Any time you start combining foods that each have their own healthy properties, you end up making an even healthier hybrid. 2. Healthy Broccoli and Cheese Soup – This is one of those soups that you usually have to give up when you’re watching what you eat because of the cheese and the cream. But here is a healthy version that will have you all of the flavor, without the guilt. This is suitable for plenty of diets, including Paleo, Vegan, and low-fat. The cheese is only used as a garnish, so you get to control the amount and type of cheese you use. 3. Green Lentils With Coriander – Lentils are a food item that is often overlooked, but has plenty of health benefits, including added fiber. They are included in the book The Four Hour Body as a great slow carb. 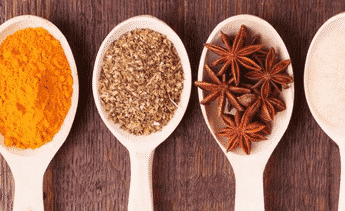 Turmeric is used and this is a superspice that has been shown to increase your metabolism. The coriander leaves add a nice flavor that your taste buds might not be used to. 4. Curried Butternut Squash and Pumpkin Soup – Squash and pumpkin combine here for plenty of fiber as well as a good helping of vitamins and minerals. It also uses milk for its creamy texture, and you can adjust the fat level as you see fit. The curry powder acts to give it a nice flavor, and overall this is going to have a silky consistency that makes it a joy to eat. 5. Multiple Personality Artichoke Arugula Soup – Artichokes are a wonderful food to eat, but it’s sometimes hard to come up with ways to fit more into your diet. They use tofu in this, which will help to give it a nice creamy texture without using cream. The arugula is going to give it a burst of extra flavor, and should play nicely with the artichokes. Overall this is a healthy, hearty meal starter with no meat or animal products. 6. 5 Minute Miso Stew – Miso soup is a staple in Japan and there is plenty of supporting evidence showing how good it is for you. You just can’t beat a soup that will be ready in five minutes, and that is also good for you. That’s like healthy fast food! The trick is they’re using a packet of miso soup mix, which makes the miso part really easy. Just add the other ingredients and you’re all set. 7. Seasoned Indian Style Lentil Soup – If you’re a fan of Indian food but don’t know exactly how to make it, this is a good entry-level recipe that will have you making a soup that captures all of that flavor. Lentils go great in soup because they get nice and tender while they’re simmering. They also add thickness to the soup so you really feel like you’re having a meal. 8. Yellow Peas Creamy Soup – Usually you’re told to try to avoid cream based soups when you’re trying to be more healthy, but this is one you don’t have to skip. The yellow peas give this a nice color and are the foundation, but they also end up adding a dollop of sour cream – you could use Greek yogurt instead – and they top it with croutons for a yummy addition and nice presentation. 9. Salmon & Cauliflower Soup with Egg – This is an interesting combination, using both fish and an egg together. It provides a big protein boost to your day, but also combines a starchy vegetable with the cauliflower, so you can eat this as a meal and feel satisfied for a long time. Onions and carrots get added to the mix, and round out this meal in a bowl. 10. Tomato Basil Soup with Grilled Cheese Croutons – Tomato basil is one of the more popular soups, and there’s no denying that those two ingredients go well together. The surprise twist to this recipe is that you put a single cube of grilled cheese sandwich right on top. This gives the classic taste of grilled cheese dunked in tomato soup, but without the burden to the waistline that an entire grilled cheese sandwich provides. Be sure to follow the directions on the grilled cheese so it turns out picture perfect. 11. Minestrone Soup – Here’s a classic soup that provides plenty of nutrients and vitamins, tastes great, and won’t weigh you down. It’s a very popular option for restaurants, and a great lead in to a meal. You’ve got carbs from the pasta, and plenty of vegetables and herbs in this. The only thing that’s missing to make it a meal is a protein. A chicken breast would go nicely with it, if you wanted to round it out. 12. Flu FIghter Chicken Noodle Soup – When you or someone you love is not feeling good the last thing you want to do is spend a lot of time getting this feel-good food ready. This recipe not only keeps things really healthy, but it gets it ready in a matter of minutes so you can start the healing sooner. Studies have shown that the old wives tale of chicken soup helping a sick person actually has validity to it. 13. Quinoa and Kale Soup – Quinoa has really gained ground in recent years as far as its popularity goes. Combine it with kale, a superfood in its own right, and you’re getting a good dose of protein, as well as the iron, vitamins, and detox properties kale brings. They’ve also come up with a nice mix of additional ingredients to make this a soup you’ll return to again and again. 14. Roasted Vegetable Soup – Roasting the vegetables gives this soup tons of flavor, and also seals in all of the vitamins and nutrients from the veggies. The ingredients list reads like a who’s who of extra healthy foods, and they also recommend topping this off with a lean protein if you want to have a satisfying meal. If not, it makes a great starter. 15. Loaded Vegetable Chicken Soup – Bring on the vegetables! With the added chicken in this recipe you’re getting a soup that can also serve as a meal. The veggies include broccoli, carrots, celery, and zucchini, but don’t worry, there’s still plenty of room for the chicken. Definitely good for cold winter days and flu season. Many chicken soups skimp on the vegetables, but you won’t have that problem here. 16. Uncle Ron’s Vegetable Beef Soup – With the beef included in this recipe you’re going to get a good amount of protein, and with the vegetables you’ll get fiber and plenty of nutrients. They recommend using lean ground beef. Go with a nice ground sirloin that’s 90/10 and you’ll be all set. The vegetables include spinach and carrots for a yummy hearty soup. This is the only soup recipe with beef on our list, and they do a great job with it. 17. Butternut Squash Soup With Roasted Red Pepper Puree – Here’s an interesting flavor mix. You don’t often see coconut added to a squash soup. The red pepper puree gives it a nice presentation, as well as a third taste that ties in well with the first two. Thyme and orange peel are used, which contributes to the anti-inflammatory effect of the soup. 18. Mung Bean and Kale Soup – Mung beans are great for helping to regulate your blood sugar levels, as well as working to lower your cholesterol levels due to the fiber they contain. You can’t beat adding kale to this soup, as it brings with it all of its phytonutrients and other health benefits like extra iron and calcium, and is good for the heart. It’s always nice to try new things, and if you haven’t tried mung beans this is a good recipe to start with. 19. Miso Chicken Soba Noodle Soup – Soba noodles are made out of buckwheat, and offer a different taste than ordinary pasta. Miso is a popular soup in Japan, and has many reported health benefits. By using leeks and shiitake mushrooms you’re making a soup that is much different than most of the other soups out there. Eclectic and healthy. 20. Paprika Spiced Cauliflower Soup – The paprika gives this an amazing amount of fiber, and cauliflower is a fantastic cruciferous vegetable that makes many top health foods lists. If you’re worried that cauliflower can’t carry the lead role, don’t fret, there’s also carrots and onions to help out and provide different textures. Overall this is going to provide you with a very tasty and waist-slimming starter to any meal. 21. Hot and Sour Soup – If you like to order this soup from your local Chinese food place, here’s a way to get the same flavors without resorting to a soup that is high in fat. The use of Chinese mushrooms will make you feel like you’re at a restaurant, and the tofu and bamboo shoots are replicating the flavors that you’d get if you had it delivered. 22. 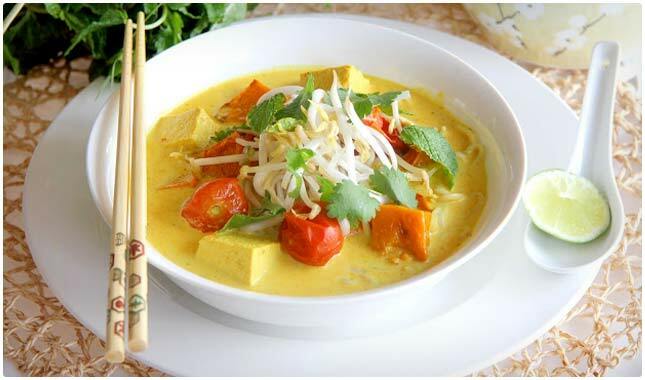 Cherry Tomato and Pumpkin Laksa – Laksa is the name of a spicy noodle soup that is popular in places like Malaysia and Singapore. This variation keeps things very healthy by using cherry tomatoes and pumpkin as its core ingredients. With bean sprouts and tofu chunks you’re getting a lot of nutrients packed into one bowl. It’s interesting that they combined tomatoes and pumpkins, but it works! 23. 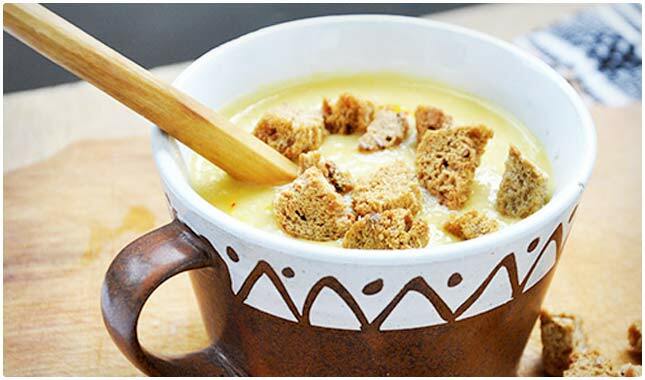 Cream of Celery Soup – Celery is often thought of as a diet food, and few people like to eat it raw. This is a way to get the good things that celery has in it, without gnawing on a celery stalk. If you’re concerned about the cream, don’t be. It’s made with Greek yogurt so it’s less fat and has more protein. The olive oil drizzle as garnish really works for presentation. 24. Broccoli Pistachio Soup – Broccoli makes it onto our list of healthy soups a few time, and this is because it lends itself so well to soup form. There are several benefits to eating broccoli, and none of them are lost with this recipe. It also adds an interesting ingredient, pistachios, to give this a unique flavor, while also getting the health benefits from an often passed over nut. Overall a nice dish to enjoy before dinner, or as a hearty lunch. 25. Roasted Butternut Squash – Roasting the squash before adding it to this soup gives it a nice flavor, far superior than steaming it or microwaving it would. This increases the cook time, but it’s worth the wait. 26. Creamy Butternut Squash and Anjou Pear Soup – Here’s a recipe that’s great for autumn days, or any time of the year. The addition of squash and pears is not entirely new, but it definitely works and packs a lot of flavor. Go with organic squash and pairs, since they make up so much of this dish. The cream is made with Greek yogurt and they even use egg whites so you know you’re being good with this recipe. 27. Silky Spinach Soup – No one can argue that spinach is one of the best foods you can eat, but it’s not always convenient to cook with it or use it as a side. This soup uses it as its foundation, so you know you’re going to get a lot of nutrients from it. But it also contains protein and fiber to keep your body well-regulated. This is a soup that would make a nice side to a serving of a quality protein. 28. 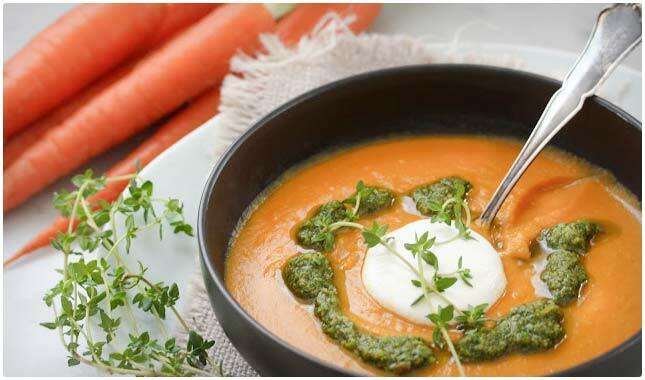 North African Carrot Soup with Chermoula – Carrots make it onto our sampling of healthy soups, and the combination of seasonings used in this are nothing short of spectacular. This is a dish that you can enjoy on your own or with your family, or use it for when company is over for dinner and you’re sure to get compliments. 29. Roasted Red Pepper Soup – Red peppers contain a nice amount of flavor, and are actually green peppers that have fully ripened. They use cottage cheese to make the cream, a genius way to add protein to the soup, without adding the extra fat and calories that come with cream. The end result is a pretty soup that also tastes great. 30. 20 Minute Chicken Tortilla Soup – If you love to order tortilla soup at your favorite restaurant, here’s a way to replicate that taste at home, and in just 20 minutes. 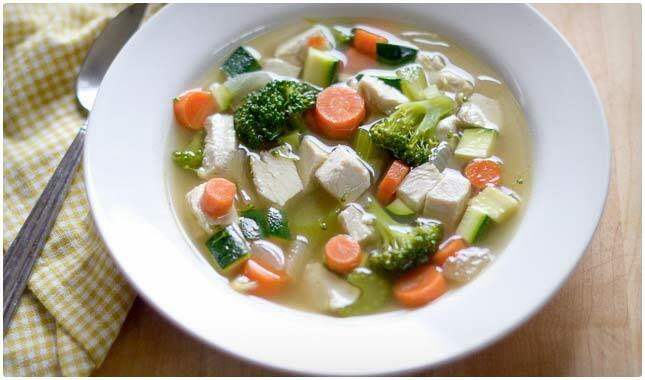 This is one soup that you can eat as a meal if you increase your portion size, because it contains chicken for protein and veggies for nutrients. It’s really up to you how you want to use soup. It makes a great light meal on its own, especially if you pair it with a side of bread, or add a quality protein to it if it doesn’t already have one. You can also use it as a way to prepare for dinner, by getting your digestive juices going. The hotness of it and the fact that it’s easy to digest makes it a great meal starter. Love everything u have you have published.